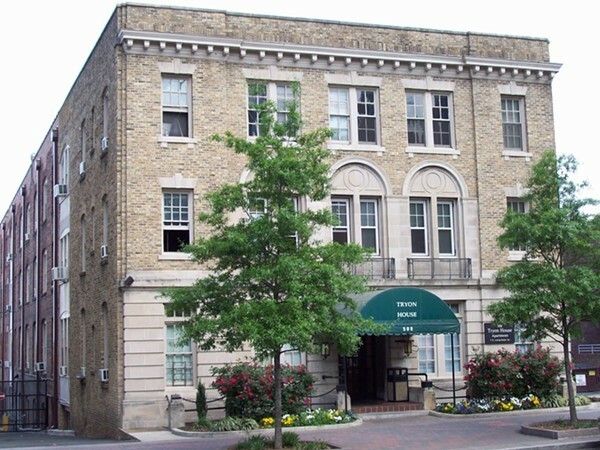 The historic Tryon House was built in 1918 and served as a fashionable yet economical in-town residential location for singles, young married couples and even small families. The building was expanded upon in 1926, with a second, larger addition added to the back, making it stretch an entire block to College Street. 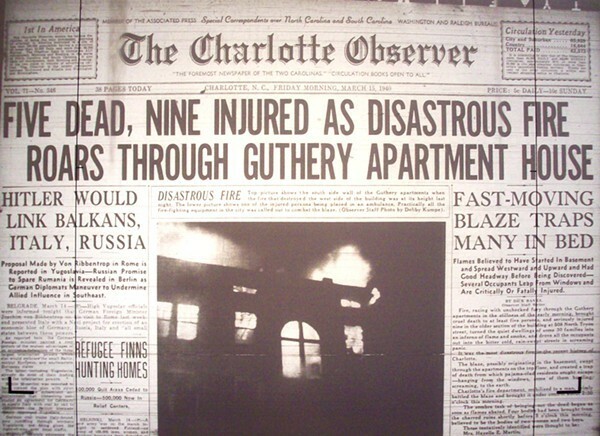 The building used to be known as The Guthery Apartments, and it was a scene of one of the worst disasters in Charlotte's history. In the wee hours of March 13, 1940, a massive fire, probably caused by a boiler explosion in the basement, swept through the three-story building, claiming the lives of six and seriously injuring nine. Among the dead: H.R. and Etta Ely; Hazel Martin and her son Edward; Rowena Dickinson; and Mabel Rockett. According to the city’s then-Fire Department Chief Fire Chief Hendix Palmer, the flames from the boiler fire grew so hot that they melted two gas meters nearby, which then reacted like giant torches, sending flames up the elevator shaft from the basement to the top floor. Inside the charred apartments, it was later discovered, the heat was so intense that aluminum cooking pots actually melted, leaving only their handles. According to Ashton Rockett, a former manager of the building from 1992 to 1994, the building may have some “residual energy” floating around from some of its earlier tenants. Rockett, however, says that was the least of the eerie factors about the building. “Practically everybody that lived there had some kind of ghost story. A friend of mine frequently heard what sounded like someone crying and throwing themselves against the wall in an apartment beside him, when there was no one living there. Another tenant claimed people were banging on his door at all hours of the night but there would be no one at the door or running down the hall. Keep in mind the fire is a confirmed part of The Tryon House’s history. The rest of the story ... well ... I’ll leave that up to you to decide. Ghost stories aside, The Tryon House is an architectural gem and would be a fascinating place to consider for a residence. "Question the Queen City: The Tryon House", David Aaron Moore, Creative Loafing Charlotte, October 1, 2012.